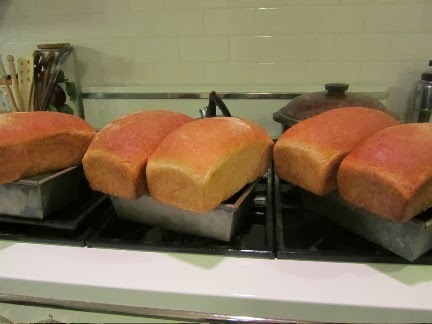 creative savv: Is there anything that smells better than bread fresh out of the oven? Is there anything that smells better than bread fresh out of the oven? Oh, the aroma is intoxicating. Sometimes, I have great restraint and can wait until the bread is fully cooled. Other times, I just can't help myself. Needs no butter, jam or jelly. I'm in heaven. So funny that this is your post today! I decided to make your all-purpose pizza dough/French bread recipe as a bread today (to go with stew)--I realized after I added the ingredients that my recipe only details how to make the pizza dough. So I'm going to search to see if you have specific instructions on making the bread (but if I can't find it, I'll just wing it!). I think the smell of bread is what Heaven will smell like. :) Love me some bread. I don't think I'll ever do those non-bread diets that are so popular. if you're doing French bread, divide the dough in half, then press out on the counter, into a large rectangle. Roll the dough up jelly roll style, pinching the ends/seams well. Rise on a buttered baking sheet until almost doubled. 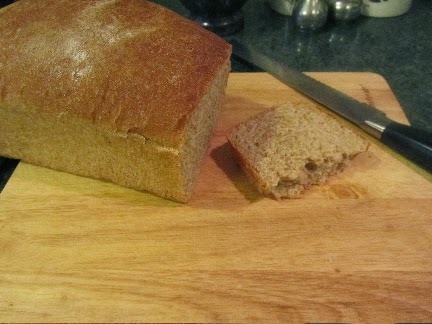 I have been baking the bread at a higher temp lately, and really liked the crust (I think about 475 F). When I go to preheat the oven, that's when I make slashes in the top, and brush with water (gives it a sheen). Bake until golden and hollow sounding when tapped. I don't bother with the pan of water at the bottom of the oven. I found that brushing with water worked just as well, as was easier for me. (I kept burning my hand when tossing the water into the heated pan -- which is how the "experts" say to do the pan of water -- heat pan in oven, then add water for maximum steam). When I've had to give up grains to get my system back in shape, it's the yeast bread that I miss the most. I tried a commercial gluten-free yeast bread. It tasted great, but it made my symptoms worse. I'll do whatever it takes to keep bread in my diet! I've actually got mine rising on my pizza stone right now. I like the idea of brushing with water. My old recipe has you use a spray bottle to spritz the loaf with water periodically but that's sort of a nuisance--I like to let things bake and get on with the rest of my day! Thank you for getting back with me!!!!! Can I come for dinner? Crusty French bread sounds so yummy right now! The only thing that might smell better than freshly baked bread is freshly baked chocolate chip cookies. You may be on to something there. Fresh from the oven chocolate chip cookies do smell wonderful! have you tried baking any GF yeast breads at home? glutenfreegirl.com is a fantastic site for GF baking. I've made several of her recipes, including a yeasted bread. It tasted great, but had gums in it, and I can't have gums any more. Anyway, check her site out.